Less than five years ago, Olly Murs was just a self-proclaimed "normal bloke" auditioning for UK’s X-Factor: a "normal bloke" with an amazing voice. In his initial appearance on the show, Simon Cowell claims Murs was the "easiest yes" he’s ever given. Since then, things have certainly changed for this soulful pop artist. 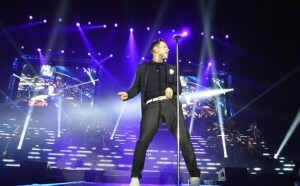 With three albums and a sold-out arena tour in 2012, Olly Murs and his 2013 tour of US and Europe is reaching new heights. With large moving scenic elements and a tall video orientated set, Olly Mur’s production dimensions are certainly ambitious. Ant Carr, tour production manager via Production North, is making sure the tour takes every necessary precaution with system safety. During rehearsals he engaged Load Cell Rental (LCR) to provide an accurate assessment of the dynamic loads. "The rig itself is typical for an arena tour," explains Carr. "Tour rigger Mark Wade from OTT is hanging over ninety points. Some of those flown elements are known; for example, give me fourteen boxes a side of most line arrays and we know what weight we’re talking about. But with screens it’s different; there are so many different brands of LED screen module these days that it’s difficult to keep track – so you need to be certain. For the Olly Murs show we have a 115’ V shaped catwalk that lowers out of the roof which Olly uses to get out to the B stage. Again that’s an unknown item in terms of its dynamic weight over the whole span once moving, so it has to be measured accurately." Carr took a 60 point weighting system from LCR for production rehearsals. "They also performed the weighing as a service and very efficient they were too. We knew which elements we wanted to weigh, but it’s an interesting experience for many people when you confront them with an accurate system like LCR’s. We all assume that we know the weights of familiar items, a one-ton hoist for example, but often the presumption is incorrect. Even with something as mundane as that the actual weight readings can be a bit of an eye opener. We also have side-fills hung directly from cable management trusses; combination loads like this are becoming ever more common, trusses can have lights, sound and video gear on them these days, and the equipment weight data all comes from different sources and contractors. All these things combine to confuse the issue. With the LCR service there’s no doubt; we know exactly where we stand." 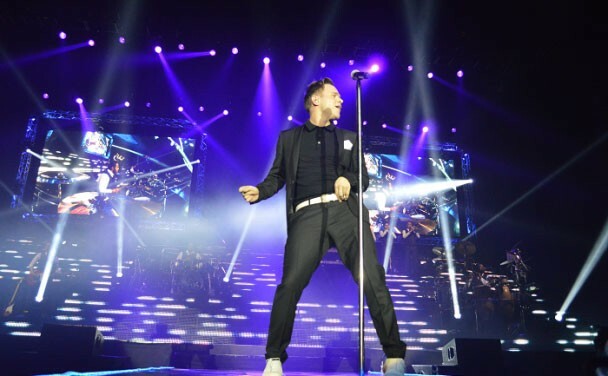 The current UK leg of the Olly Murs is drawing to a close, followed by shows in Europe and the US through April and May.